Here are 5 free tabbed PDF readers to open multiple PDF files together. Some of these PDF readers are quite popular among their users as they provide various useful tools with them. Using these free PDF readers, you can easily open multiple PDF files very easily in their tabbed interface. There are situations where you want to open multiple PDF files. In that case, instead of opening multiple instances of your favorite PDF reader to open multiple files, won’t it be better to have a PDF reader with tabs that can open multiple files in the same interface? For the same purpose I have compiled the following list of PDF readers with tabs that you can use to open multiple PDF files together. There are many free PDF readers available, but most of them do not support opening multiple files in tabs. So, here I have listed some PDF readers that can do that easily. Many of us already know about Foxit Reader as it is one of the most popular alternative out there to Adobe Reader. Foxit Reader comes with various built-in PDF tools and options to open and view PDFs. The best part is that you can open multiple PDF files in it as it supports tabbed interface to open multiple PDF files together. To open multiple PDF files in Foxit Reader, you don’t have to do anything in the software or enable any option. Just open your PDF files by double clicking on their icons. 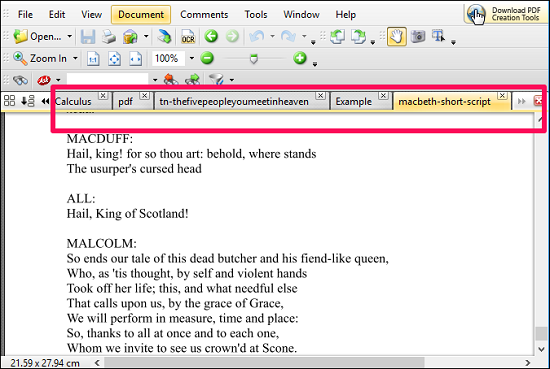 As you keep opening multiple files, you will notice that they will automatically open in different tabs of Foxit Reader. You can see the below screenshot. 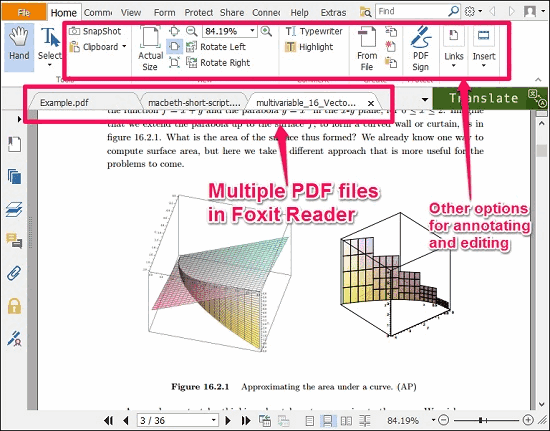 So, in this way you can open multiple PDF files in Foxit Reader. Overall, I find Foxit Reader is very nice PDF reader that is fast and loaded with numerous noteworthy features and of course, comes with a tabbed interface to open multiple PDF files together. Sumatra PDF is a lightweight tabbed PDF reader to open multiple PDF files together. It comes with simple user interface and very basic PDF tools such as zoom, rotate, find, favorite pages and many more. Apart from these features, the feature that we are interested in is that Sumatra PDF lets you open multiple PDF files in tabs that it provides. 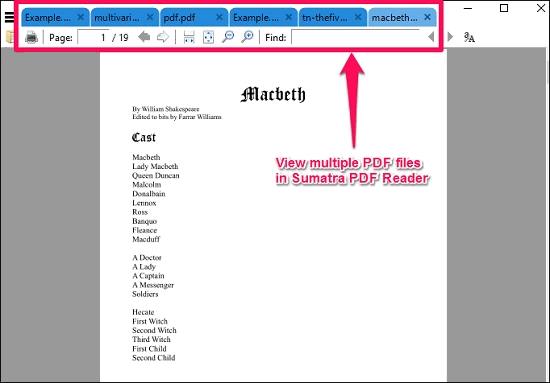 To open multiple PDF files in Sumatra PDF, just open your PDF files one by one by double clicking on each of them. Doing so, you will notice that the PDF files will open in different tabs of the software. You can see the below screenshot. In this way, you can open multiple PDF files using Sumatra PDF reader. If you want a free and lightweight PDF reader that supports tabs, then you can go with Sumatra PDF. 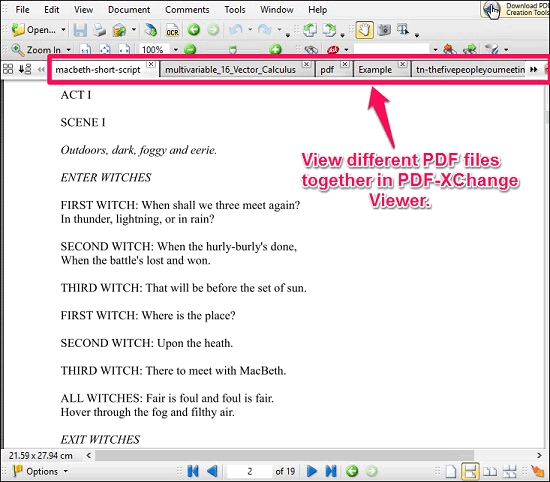 PDF-XChange Editor is another lightweight tabbed PDF reader that you can use to open multiple PDF files. It has very polished user interface and tabs are provided for viewing multiple PDF documents. It’s fast and provide various features for PDF files such as editing and annotating. For more complex features, you will require the paid version of this software. Again, to open multiple PDF files using PDF-XChange Editor, you can directly double click on their icons. Files that you open after the first file will be opened in different tabs of the software. And the best thing about this free PDF editor is that, it has a built in OCR that lets you extract text from documents. See the below screenshot, showing interface with different tabs. If you want a tabbed PDF reader which is lightweight and have PDF editing features, then you can try PDF-XChange Editor. 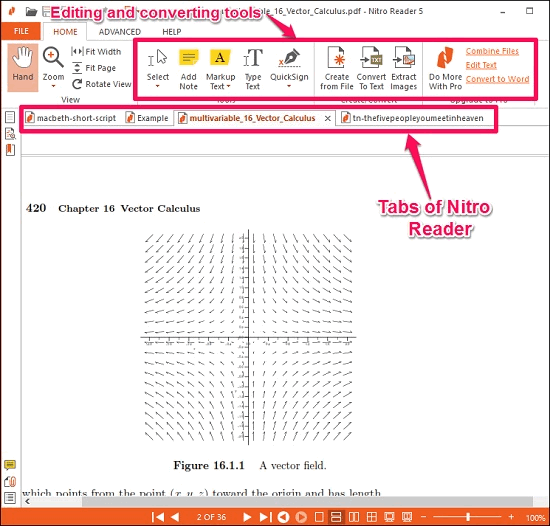 Nitro PDF Reader is another free tabbed PDF reader that has MS Word like interface and can be used to create, convert, and edit PDF documents (though, some features are paid). It has some unique set of tools one of which is QuickSign tool, which allows you to place a hand written signature on the page. And one of the best things about this PDF reader is that it lets you open multiple PDF files together in different tabs. You can open multiple files in the same manner that I explained for above mentioned PDF readers. The only thing that is different in Nitro Reader is that the tabs in it’s interface are arranged as panes. See the below screenshot. So, Nitro PDF can also be used to view multiple PDF files together. If you want a tabbed PDF reader with various features to convert, create and edit PDF files then you can try it. However, it is quite large in size. 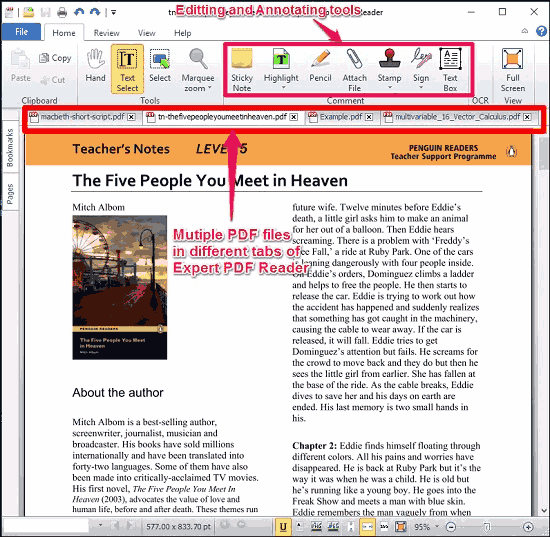 eXPert PDF Reader is another free PDF viewer, editor, and annotator that is quite small in size (15 MB) and offers basic tools to do various operations on PDF files. It offers other features also (you can see it’s detailed review here). Opening multiple PDF files using eXPert PDF Reader is very easy. Just open files one by one and they will open in different tabs. Alternatively, you can also use drag and drop method to open various PDF files in eXPert PDF Reader. You can see the below screenshot, showing interface of eXPert PDF Reader‘s interface. Overall, I really like eXPert PDF Reader for opening multiple PDF file together in its tabbed interface. These were some pretty awesome free PDF readers that let you open multiple PDF files in different tabs. You can open multiple PDF files by selecting all files, then hit enter or you can simply use drag and drop method to open them. Some of these PDF readers are quite large in size, but they also come with a huge set of features. Try any of these PDF readers to open multiple PDF files, and I am sure they will not disappoint you. And if you know some other free PDF readers out there to do the same, then do let me know in comments below.